9-6-05 – My apologies if on occasion I convey my views on gardening and landscaping with a vehemence that might in any way alienate or offend. I understand there are plenty of things in life more important than that our homes be attractively landscaped. The Yankees missing the 2005 playoffs, for instance. Let me assure you, people who know me will tell you I’m reasoned, practical, calm. 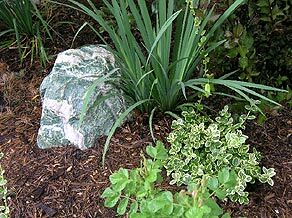 Until I see landscaping that incorporates “decorative” rock, that is. Nothing we do to our landscapes in America is more visually egregious than mulching them with gravel. Where, when, why, how, and from whom was spawned this utterly preposterous practice of spreading gravel around our houses is unknown, encoded in the lost pages of history beside the identity of Jack the Ripper, the location of Jimmy Hoffa’s body, and the origin of disco. 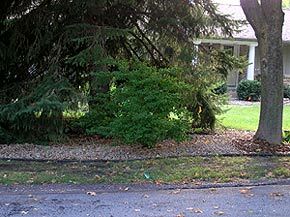 Mulching, as it were, around finished tree and shrub plantings with truckloads of one- to three-inch rock is simply indefensible. Do you like the look? Of course you don’t. If you do, you merely think you do. Ask yourself the name of the state in which you live. What do you come up with, New Mexico? Arizona? We put gravel around our homes so that the cacti ringing the patio will meld seamlessly with the native desert fanning out toward the distant horizon? Quick, let’s head to your favorite Northwestern, Midwestern, or Eastern wilderness area, and replace the leaf, pine needle, and humus woodland floor with a four-inch layer of gray, pink or—better yet—white crushed rock. There, that looks so much better, more soothing, natural. I’ve got news, Native Americans invented moccasins, not Rockports. Admit it. Decorative rock around your house looks dumb. I’ll even let you off the hook: You didn’t choose it, it came with the house. Now let’s talk engineering. Crushed rock nearly always is placed atop black plastic (so rain doesn’t settle it in) and that spells horticultural suicide. Landscapers who lay sheets of non-porous, black plastic across the planting area, cut out holes for the trees and shrubs, plant them, then finish it off with a three- to four-inch layer of crushed rock have not been reading the decade-old memos from the University of Minnesota. Water never reaches the soil beneath the plastic. Neither does oxygen, just as important to soil and root health as H2O. Earthworms and the billions of microorganisms that keep soil healthy and alive die out, or dare not enter. What is created in just a few short years is dead soil, except for the small pockets of soil around the base of the plants. Development of a healthy root system for these plants is a botanical impossibility. The situation is not improved if a porous weed fabric is substituted for the plastic. If the bed is in full sun, the rock heats up to ninety degrees in summer, stays warm all night, and cooks the soil and the few roots that manage to gain a toehold. Trees suffer severe shock, shrubs grow weak and fail to bloom, and after ten years your plants are either sickly stunted or gratefully dead. 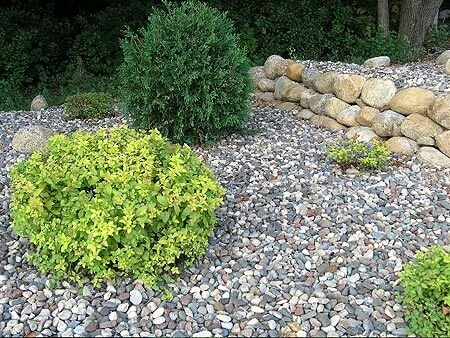 I won’t bother with more than three words concerning what it’s like to move, replace, or add shrubs to a bed that has been mulched with rock. Sheer—utter—hell. There is one thing worse: digging, dividing, and then replanting perennials that have been “rocked.” That will cure you of the nasty gardening habit forever. “But I don’t want weeds!” say homeowners. True, neither perennial nor annual weeds will grow up through the black plastic, as it blocks the sunlight. But the correct, far more attractive mulching system (that I’ll get to in a second) blocks sunlight and weeds just as effectively. 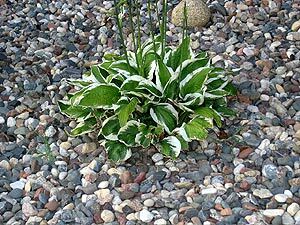 Of course, you still get weeds in rock mulch, as anyone who harbors it will attest. It only takes a few years for bits of leaves, needles and other organics to settle through the crushed rock and become soil deposits on top of the plastic. 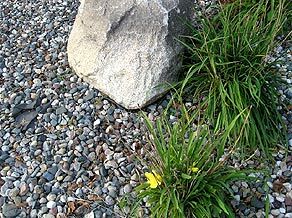 Wind-blown weed seeds land and presto, you see crabgrass, clover, and dandelions growing from the rock, sunning themselves like lizards. The solution? Around homes, and anywhere else in the landscape you have trees and shrubs, mulch with the material that looks one hundred times better plus helps your plants flourish: shredded hardwood mulch. It should be laid down in a five-inch thick layer, directly on top of the soil—do not lay down weed fabric. Circle mulch six inches away from the base of shrubs and tree trunks, so the plants don’t think you’ve raised the soil level. Which looks best? This landscape … or this one? Like all things Renegade, this is simple stuff. Shredded hardwood is dark brown, and has a lovely, earthy fragrance. It stays put on slopes, even in heavy rain. Weeds will not grow through it. Water and oxygen, however, will readily pass. Every inch of soil beneath it will be alive, and benefit from the slow decomposition of this five-inch organic layer. Plants flourish—they’re growing from a forest floor, not the crushed-rock median strip of a Palm Springs Wendy’s. Occasional wind-blown weed seeds will germinate, as in rock mulch, but are effortlessly plucked by hand. For the average landscape this task might take you two hours per year. So what? Get off your cell phone for fifteen seconds. After several hard rains the mulch locks down into an immovable, porous layer. Use a light touch with either rake or blower and leaves are removed as easily as from atop crushed rock. Yes, in three years the mulch will need replenishing. So order up a delivery and spend an afternoon of quality time with spouse and offspring, or write a check to a lawn service and have them do the job. Once the rock has been replaced with shredded hardwood, step back and think how grand the world is. No more stifled plant growth. No more rock in the lawn to foil the lawnmower blade. No more desert motif. Your home and yard look lovely, natural, and I am calm once more.